FabKids knows that active children need sturdy, stylish clothes! So that's exactly what we set out to do. You can see in the picture above that my son doesn't lack energy or on putting his clothes to the test. With FabKids, I never worry. They're high-quality, comfortable clothes, always! String-draw elastic waist band for comfort and adjustability! 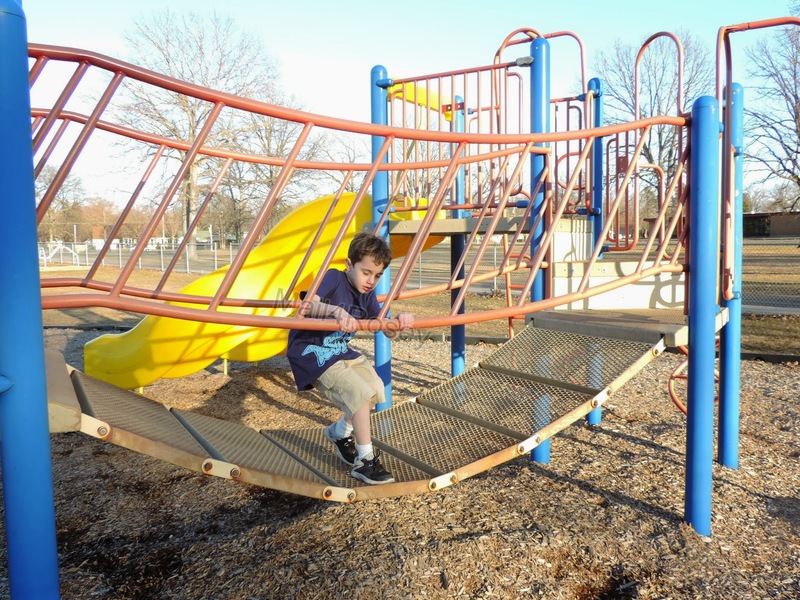 While at the park, little man needs room to move, while still having clothes that won't be loose enough to get caught on things while he's running around. The Cargo Shorts fit the bill with their tie-draw waistline that allows for comfort and unrestricted movement too. These Cargo Shorts are also great because they have three big pockets (little boys like to store/carry things). Two of the pockets are on the front, and one is on the back. The Great White Graphic Tee is slightly fitted throughout the body, but still very roomy. It has a fun graphic in bright blue that is printed on the Navy tee. We have only washed this once (to wear it) but I have little doubt it will hold up well, simply because of our experience with graphic shirts from the FabKids clothing line. Finally able to break out the scooter after a long, cold winter! Once we were done with the park, we figured we'd test the sidewalks out too...and I got the scooter out of the trunk of the car. 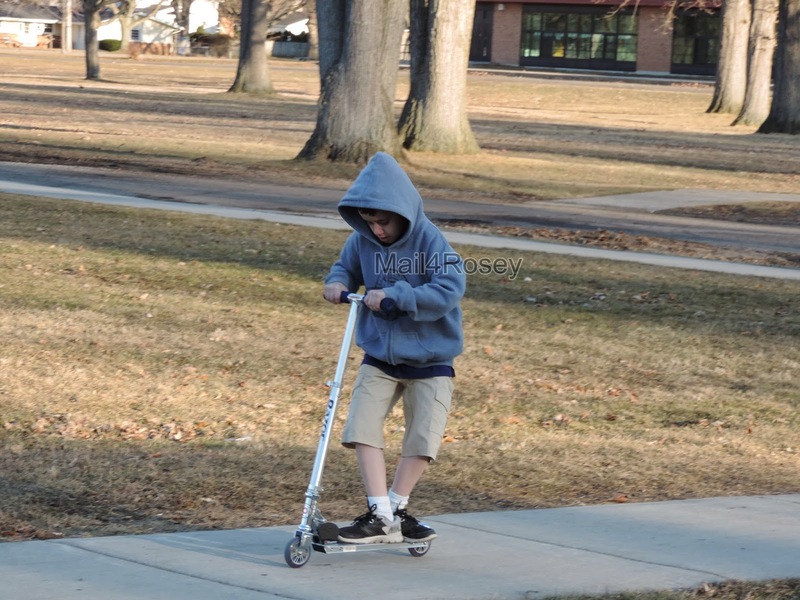 Little man's been itching to ride his scooter all winter long, and he was thrilled to finally get the chance. "Look Mom, this is my new trick!" 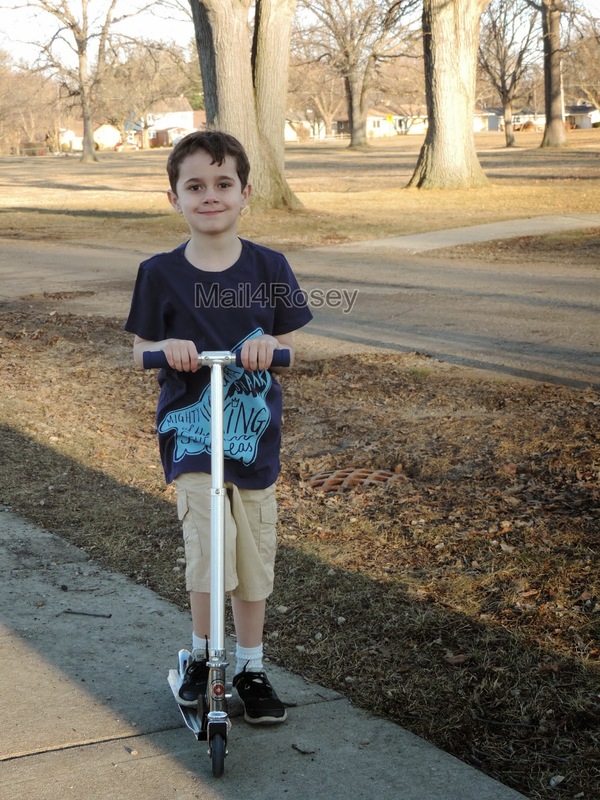 We loved his new FabKids outfit for March, and we loved our day out at the park. FabKids is a monthly clothing subscription service for children aged approximately 2-12 (boys and girls!). Each month, if you want to participate, a pre-determined amount is charged to you. Then in turn your FabKids account will be credited with one outfit. You can shop for that outfit whenever you have the time. If you need or want to opt out for the month, you simply indicate that by the due date, and you will not be charged. There is never any obligation to buy, the outfits are stylish and very durable, and they are affordable too. 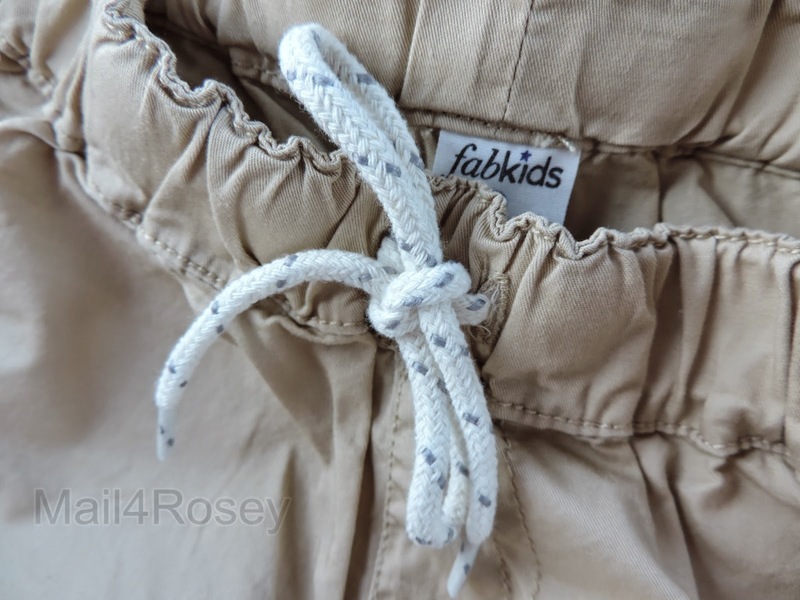 FabKids was founded by a group of moms, one of whom just happens to be famous actress Christina Applegate. The fashions are cute, even for the boys (not always easy to find), and the convenience and practicality of having an outfit delivered each month is just awesome rad. Right now those new to the service can get 20% off of any one outfit or item, and free Shipping & Handling too. There are also always ongoing sales and deals to find for existing members too. He looks all ready for the summer months. Too cold for shorts here just yet... but soon. Your son is adorable. I love his cool new outfit :) Fab Kids has such cute stuff. He is so cute! I want to try out FabKids now too! Cargo shorts are great for boys. They love putting things in their pockets... all of them. Great for men too! I always buy my Hubs the cargo shorts. I absolutely love his shirt!!! So cool. My son would love it. Cargo shorts work great for my son too! Those are great outfits. I especially love the hoodie. Hopefully the rest of spring won't require quite as much use out of it! We're ready for summer! I love that the pants have a tie so he can grow into them. Looks like nice stuff and your son sure looked handsome in his new clothes! Aww he is so adorable in his new Fab Kids clothes. I've made several purchases from Fab kids and always love the look and quality stuff I've gotten. I am thinking gifts for the Grandkids. Mine sure do love new clothing. I agree. They look great, nice and durable too! Me too - checking this our for Davey! He would love the Shark shirt! I've heard of FabKids, but I've never tried their clothing. That's going to change soon. Your son's clothes look sharp AND rugged. I've never heard of FabKids before, but after reading her post, I definitely want to check out their store. Sounds like a great company. My son would like these shorts. No buttons and zippers that is what he likes! I am always very impressed with Fab Kids quality of clothing and the GREAT selection they have for boys. I've seen so many subscription boxes, but haven't seen this one. What a great idea! Love all the clothing! Fabkids always has such great clothes. Love that shirt! This is such a cute outfit! My boys love comfy clothes too! It's going to be time for school clothing shopping soon. I need to check this out. I see why they call it FabKid because your kid looks fabulous in that outfit. This looks like such a great outfit! I've never heard of this brand before but will for sure look into it more! Love it! I had never heard of FabKids but these are some really cute boy's clothes! I'll have to check them out! That shark shirt is too cute! I cannot wait until we can wear shorts! This winter has lasted forever. I love your son's stylin' outfit...perfect for the park! I am really digging the clothes from Fabkids I think I need I'll have to grab a few pieces if I can! It all is super cute and fashionable! I'm envious of your son being in shorts! Fab Kids looks awesome, I will definitely have to check out their services. Thank you! How cute. These look like really comfortable outfits. Cute! My son would have flipped for that shark t-shirt when he was younger. Heck, he still probably would. Love these clothes!! They'd be perfect for my four boys! You always find the best clothes on FabKids! I must try them out because 20% off is a great deal, and the clothes look so cute! Aww he looks like he is loving his new clothes. I love FabKids they have such great stuff! That is a nice subscription. Love the outfit. Oh guess what? Wouldn't this be awesome to surprise a mother-in-need???? Cute kid and that outfit looks just right for spring and summer. He looks like he loves his new clothes. I haven't heard of FabKids so I better go check them out for my grandsons. It looks like it's warming up at your place. We have snow tonight, sigh. Your little man looks very handsome in his outfit! What a cute outfit. I have heard a lot of great things about FabKids. Will have to check them out. Of course, he rocks those close like nobodies business! Where's your snow? We got dumped on today. Hmph! He is such a sweetie! I love his new clothes- it's not quite spring here, yet, but I cannot wait! How handsome is he? 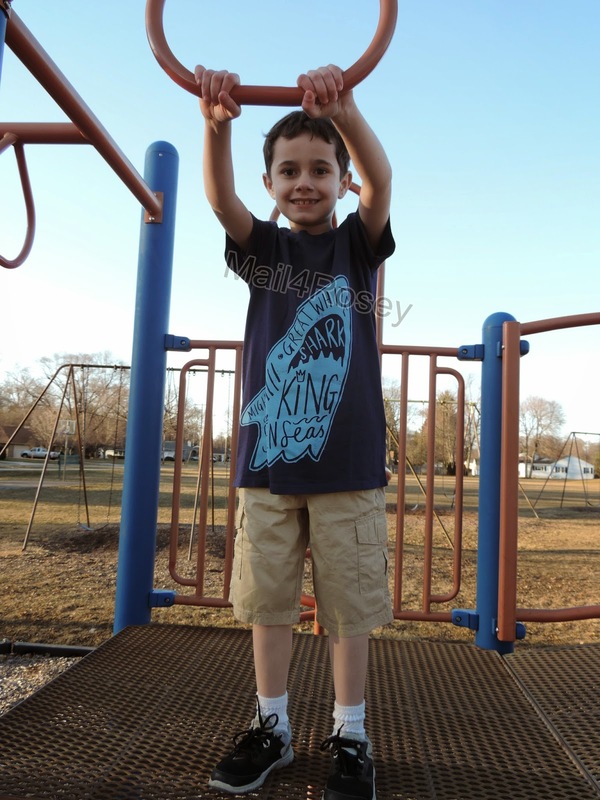 I love that shark shirt too, my son is really into sharks! I haven't seen one outfit from FabKids that wasn't good looking. Of course your handsome young man is also a perfect model. Love the pictures! That shark t-shirt is the cutest! What an amazing company for kids clothes. I love learning about them and will share FabKids with my friends. Some of the best companies like this were created by moms! That park looks exactly like the park by my house. Love the pictures! I need to look into these FabKids shorts for my son. They would be great for school since he wears uniforms and the drawstring tie would eliminate the hassle of buttons, which are difficult for him. I was just thinking the same thing! The drawstring is great for kids on the go! FabKids always has such awesome clothes. It's easy to want to spend all my money on clothes for my kids. The FabKids look very stylish and just what the young ones want to be wearing. I notice on the closeup of the drawstring pants and they look very well made., which tells me my child should out grow them before they fall apart. What great clothes! Thank you for sharing. These clothes are adorable and so is your little man! I love clothes from FabKids. Their outfits and colors are just awesome. Looks like he is ready for spring! Bring on the warm temps! I have never heard of FabKids, but these clothes look awesome! Thanks for sharing! That's a fabulous post! Your kid looks great in those clothes! Thanks! Great clothes. Time to put away those winter coats! Such a snappy outfit! Hooray for spring! This is a cute outfit. I love the draw string in the shorts. My kids are all super skinny and need adjustable waists especially in jeans. Graphic tees are fun but your right they always end up peeling off. I've read to was them inside out and hang them up to dry or lay them on top of the dryer to air dry. It's supposed to help keep the print from peeling off. The hot dryer makes it peel more. That is an adorable outfit. My son is into the basketball shorts and long sock look. I love that blue shirt for my nephew! I can already imagine him in it!!! I have heard a lot about Fab Kids! I'll definitely have to check them out sometime. I love this little outfit! The shirt is adorable and the pants look so comfy! You little guy is such a cutie and these clothes looks so cute on him. I haven’t actually checked out the Spring collection in malls yet! Maybe I should drop by and pick up some Spring clothing! What a cutie! Love his new outfit! I have had bad luck with Fab Kids except for the shoes. Oh we cannot brake out the shorts here yet...but they are adorable! I know my Son would love that shark shirt too. 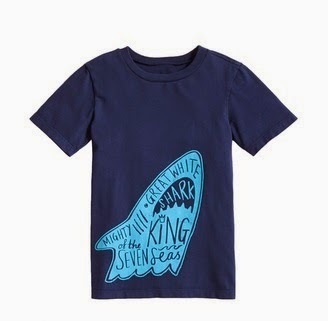 My son is all into sharks lately (so is his friend), this shirt would be perfect for him! It looks well made too, like it would last. I love the shark shirt - too cute. Davey would really like it! Fabkids have some really cool looking clothing for the cool kids! Love all your clothes that you selected. Gotta check out FabKids for my own. Thanks! I never heard this one yet. Thanks for sharing. I will check out this as I have a 5 year old and she's growing like a weed. What a cutie! I definitely need to check out fab kids! I love that shirt! I wish they had infants sizes becasue I would totally get that for my son! That is a cute boy outfit. I struggle with clothes for my little guy sometimes. I hate character tees and he'd wear them all day long! This is an outfit we'd both agree on!. I love how colorful the clothing are also. Your son is definitely a good ambassador of these outfits! aww your son is so cute! Those shirts look so comfy! He is adorable! My youngest is too small for FabKids and my oldest are too big, so we're playing the waiting game until the little one can fit. I think Fab Kids is such a great idea! The clothes your little man got are so awesome/rad :) It was the same here...really nice in the 60's....yesterday it snowed and the snow is STILL on the ground. Not a good thing! Cool clothes! I love it! Fab Kids monthly sub is such a fantastic idea. I wish they would care infant clothes, but I guess it's worth the wait for their stylish options. I have never heard of FabKids before but they have really cute stuff. I love the shirt your son is wearing! That outfit is awesome! I love FabKids! FabKids always has such a great line of clothes. He looks like he is more than ready for spring. My nephew would love this outfit! He is just like my husband. Already sporting the shorts. The sun being out is just a tease. lol It looks like spring, but doesn't feel like spring. I think I may be the only person on the planet who hasn't tried fab kids...yet. I was introduced to Fab Kids awhile back when they wanted me to try their outfits and write a review. Unfortunately my kid is too big for their sizes. I think their array of clothing is cute and has a good price point! That shark design on the shirt is very cute. My nephew would definitely like something like that – sharks and dinos are his thing. I need to check in to this for both my kids! Love your choices! I love that shark shirt! Fabkids always has the cutest clothes! What some great looking clothes, they look so comfy and they are so cool! I thought I was all set for when I weather got warm (last week). I had ordered 8 pairs of short - somewhere else - a size up from last year and they were too small! So he had to suffer through last week in jeans and then it was cold again. LOL! But I am ready for sure now. Now just waiting on a day to start and end warm enough for shorts. It's probably too late for us a FabKids. When my 10 year grows out of this size, I'll be looking in the men's dept! No doubt he will be taller than me before he gets to middle school. That's a great outfit. Those shorts look really comfy. Can't wait until it's warm enough around here to wear them. i'm going to need to order some of these clothes, so cute!!!! Oh my gosh, I love that shirt! Kicking myself for forgetting all about FabKids before it started to warm up a bit too. My son is growing fast and he's starting to go through his clothes quicker. This sounds like a good band to check out. I love those outfits. It;s so nice to welcome spring and even nicer to do so in some cool new clothes! I love FabKids. Such a great outfit. This is a great service for kids! I really love the reviews you do for them! The clothes are super cute and the kids are always hapy to be wearing them. Your lucky to have such a cute, fab kids. Mine grew up. Looking good!! I love that shirt. It would be perfect for my son! I was checking out Fabkids thanks for sharing! I will have to share with my niece so she can get some clothes for her little boy and girl. Thay wi=]ould love this. those clothes look so comfy! That shark shirt is great, too. FabKids always come up with high-quality products. Your son looks pretty cute in that outfit. The Graphic Tee looks awesome. I will have to check out Fabkids for my nephews! Every outfit he has worn looks so cute and comfortable. So glad they have a subscription service that is actually kid friendly for the clothes!!! FabKids is awesome indeed because they have an awesome select and good quality clothing. I love you get to choose if you want to order that month and it is awesome to have a new outfit every month too. Thanks for sharing. Your little guy is so handsome! Looks like a model! I don't remember ever hearing about FabKids when my son was younger, but will share this with my s-i-l! He is so stylish! you have a great model! My son's entire wardrobe is basically sharks... he needs this shirt! So cute! I've been thinking of giving them a try. Our kids have grown and need basically an entirely new wardobe! These are stylish clothes. I think both of my boys would love this outfit. They have some cute clothes. My son has a couple outfits that he loves to wear from FabKids. Nice outfit! I will have to check the site out for my little kiddo. I bet he would love it. One of my favorite times of the year was back-to-school when I took my two daughters school clothes shopping. This brand looks really sharp! Cute clothes for a cute kid! Glad you were able to tell us about this brand, because I had never heard of it! Thanks for the insight! I always love getting new clothes for spring! Those clothes look great for kids. Great idea to have s subscription service for kids clothes. That shark shirt is awesome. I am really beginning to think spring won't come here in northeastern, Pennsylvania. Seeing your kids in their short sleeves outside just made me shiver. We still have snow on the ground! These are some great outfits for the spring, though, whenever it comes. I've heard about FabKids from my aunt - she is subscribed to their service and her kids love it. I'm glad that you guys finally have a bit of warm weather over there. It must feel great to be not in winter clothes. What a great service - and I have to say that personally I love those shorts with the drawstring. My boys always end up having to wear belts with everything and that would make a nice change! That is such a cute outfit he's wearing! I hadn't heard of FabKids before, but I'll definitely check it out. I absolutely LOVE FabKids and so does my 5 year old! I love that you can mix and match the clothes too. Very cute outfits in FabKids store. Nice to shop there especially with the discount offers.